From the late 1980s through the mid-1990s, Gulfport native Mahmoud Abdul-Rauf (born Chris Jackson) was one of the most recognizable figures in American basketball. As a senior guard at Gulfport High School in 1987–88, Jackson averaged 29.9 points and 5.7 assists. His play earned him spots on the Parade and McDonald’s All-American basketball teams in 1988, and Gatorade honored Jackson as the Mississippi State Player of the Year. Upon graduating from Gulfport High, Jackson took his skills across the Mississippi state line and enrolled at Louisiana State University (LSU), where he became an instant star. In the 1988–89 season, he averaged 30 points per game and scored a total of 965 points, both records for a freshman playing NCAA Division I basketball. Jackson was the consensus pick for numerous Freshman of the Year awards, was selected the Southeastern Conference (SEC) Player of the Year, and was named to several all-American teams. 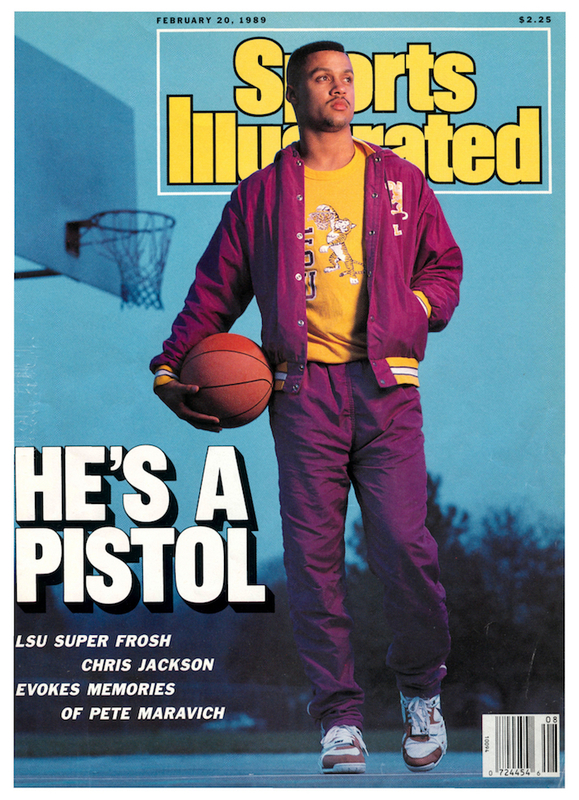 Sports Illustrated caught the buzz surrounding the sharpshooting freshman and put Jackson on the cover of its 20 February 1989 issue. The headline read, “He’s a Pistol,” a reference to LSU basketball legend “Pistol” Pete Maravich. Jackson’s outstanding performances brought back memories of the late 1960s and early 1970s when Maravich dazzled fans with his prolific scoring and creative ball handling. In his sophomore year, Jackson averaged 28 points per game and once again was the SEC Player of the Year and a first-team all-American. In the NCAA Tournament, Jackson and the Tigers suffered a disappointing second-round loss to Georgia Tech. Following the end of the 1989–90 season Jackson withdrew from LSU and put his name in the National Basketball Association (NBA) draft. Despite playing only two years of college ball, Jackson left LSU in sixth place on the list of the school’s all-time leading scorers. The Denver Nuggets drafted Jackson, and in 1991 he became a Muslim and changed his name. He played in the NBA for eleven years and had a solid career, although he failed to duplicate his feats from college. Abdul-Rauf scored 8,553 total points, won the league’s Most Improved Player award in 1993, and earned a place as one of the league’s best free-throw shooters during the 1990s. In 1996 Abdul-Rauf violated league rules by refusing to stand for the US national anthem, claiming that his faith prohibited him from taking part in any kind of “nationalistic ritualism.” He also commented that the American flag and the national anthem were symbols of the long US history of racial oppression. Abdul-Rauf’s controversial stance received national attention from both the news and sports media. The combination of public anger at his statements and a one-game suspension from the NBA prompted Abdul-Rauf to seek a compromise with the league. He agreed to stand for the anthem but bowed his head in silent prayer rather than looking at the flag. In 2001 Abdul-Rauf retired from the NBA, continuing his career in various European and Japanese leagues. For a time, he spent the off-seasons serving as an imam at a mosque in Gulfport. In December 2012 his hometown held a public ceremony honoring him and presented him with a key to the city. He currently lives in Atlanta.